On Sunday, we did another training session in the round pen. Communication is still challenging, but we're getting the job done. Heading across the pasture toward the round pen. 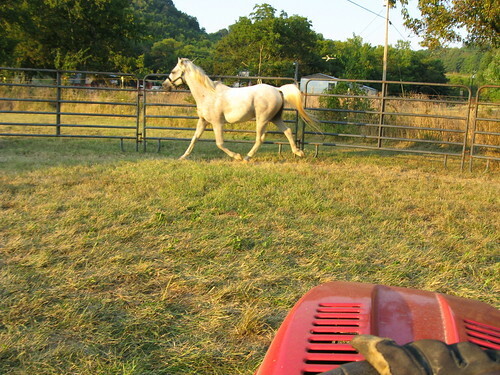 Tanna follows the mower without hesitation. After we get in the round pen, I close the gate and remove Tanna's lead rope. The I move to the middle of the pen. Tanna continues to follow until asked to move around the perimeter. Many times during the workout, Tanna asks for direction on what he's supposed to be doing. Here Tanna's personality shines clearly. Goofy horse. When we get done with the workout, I ask for a walk for another 5 minutes. And open the gate for him to leave.